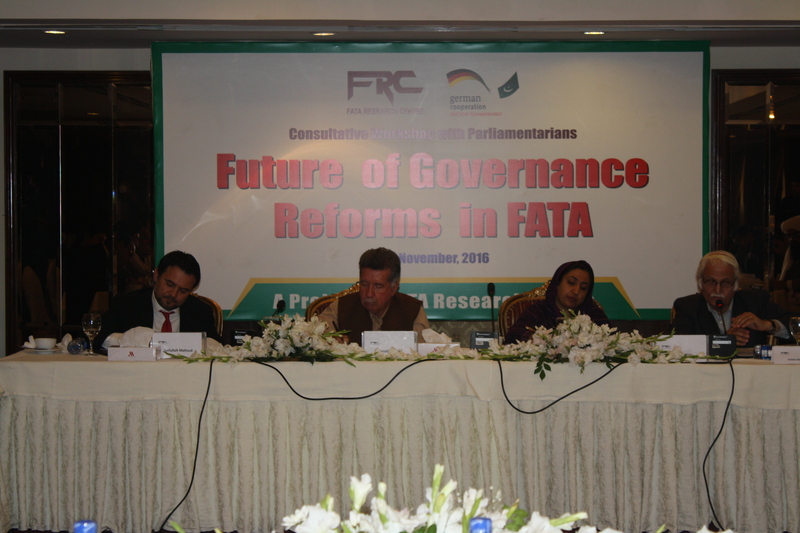 Islamabad, 18 November 2016: FATA Research Centre held a consultative workshop with FATA and KP parliamentarians and representatives of different political parties to discuss proposed reforms in FATA, on Friday, 18 November 2016 at Marriott Hotel, Islamabad. The event was attended by the representatives of all major political parties of KP and FATA including Afrasiab Khattak (ANP), Farahat ullah Babar (PPP), Alhaj Shah Jee Gul Afridi, Sajid Turi, Mukhtar Bacha (NP), Sahibzada Haroon Rasheed (JI), Muhammad Jamal-ud-Din (JUI-F), Akhunzada Chattan (PPP), Shehryar Afridi (PTI), Barrister Salman Afridi (PTI), Ajmal Wazir (PML-Q) along with the representatives from different research institutes. All of the participants, except Muhammad Jamal-ud-Din of JUI-F, welcomed the merger of FATA into KP and appreciated the endeavours of FRC in exploring public opinion regarding FATA reforms. While speaking on the occasion, Farahat ullah Babar said that the merger of FATA into KP is the most feasible option; however, he criticized various aspects of Prime Minister’s commission report on mainstreaming FATA including the provision of Riwaj Act and the distribution of development funds, allocated for FATA, through a bureaucratic office. Afrasiab Khattak also favored the merger of FATA into KP on the basis of geographic and ethnic bonds. However, he said that merger should be materialized through the Parliament. He added that a census should be conducted prior to merger in order to ensure the proper representation of FATA in the provincial assembly. “A special share in provincial cabinet should be allocated for FATA for at least 20 years to appease the people of FATA,” stated Mr. Khattak. He also stressed upon the urgency of an empowered local government system in any future governance structure to be implemented in FATA. Alhaj Shah Jee Gul Afridi also spoke on the occasion and said that the FATA Parliamentarians were going to present the resolution of FATA’s merger into KP in the National Assembly on Monday, 21 November 2016. While commenting on the proposal of appointment of a Chief Executive for FATA in the Prime Minister’s commission report, Mr. Afridi said, “The Chief Executive should be an elected representative rather than a civil servant.” He also demanded 10 percent share in NFC award for FATA. Apart from these, other participants also favored the merger of FATA into KP and urged the government to implement the reforms on urgent bases. They also lauded the endeavour of FRC regarding the Future of Governance Reforms in FATA. FRC is a non-profit research based organization that draws leading experts from their relevant fields to join their expertise in promoting the cause of peace through advocacy, capacity building and objective research on the issues confronting Pakistan and Afghanistan, with a special focus on FATA.